In May 1958 Sir John Barbirolli and the Hallé Orchestra scored a big success at the Prague Spring Festival: the majority of their second programme has been issued recently on CD by the Barbirolli Society (review). Two years later Sir John was back at the Festival, this time to conduct, for the first time, the jewel in Czechoslovakia’s musical crown, the Czech Philharmonic Orchestra. These recordings, hitherto unpublished, preserve that guest appearance. In those days I’m not sure that quite as much fuss was made about musical anniversaries as is currently the case. However, as is clear from the short radio interview that’s included here, Sir John was very mindful that 1960 marked the centenary of Mahler’s birth. As he pointed out his programme gave a nod towards two other anniversaries as well. It was the bicentenary of the birth of the Czech composer, Jan Dussek (1760-1812) and his Concerto for Two Pianos was included in this concert, though it’s omitted from the CD. In addition one of the Tudor composers represented in Barbirolli’s Elizabethan Suite is Giles Farnaby (1560-1640) and Barbirolli had realised that this composer was born 400 years earlier. So, as he put it, the programme was a “concert of the anniversaries of the Sixties’, at which point his interviewer charmingly reminded him that he himself was then sixty. Though it’s presented second on the CD An Elizabethan Suite opened the concert. I’ve never really been terribly enthusiastic about this little five-movement suite in which Barbirolli arranged pieces by Tudor composers for small orchestra. Nonetheless I can admire the skill with which the arrangements were made and I can understand their appeal – and why JB made them something of a calling-card when conducting abroad. The Czech Philharmonic pay their distinguished guest the compliment of taking the music very seriously indeed and Barbirolli must have been delighted at the expert playing. I don’t know how long Barbirolli was in Prague before the concert but in the radio interview, which is dated 15 May, he refers to attending a performance of Ma Vlast in the city “last Sunday”. That would have been 8 May; perhaps he combined his concert with a short holiday. In any event, it would appear that he had ample rehearsal time for the concert and that seems to be borne out in the standard of the performances preserved here, especially the Mahler. I know of two other recordings of the Mahler First by Barbirolli. He’d made a studio recording of it back in 1957 with the Hallé. That recording was regarded very highly by Tony Duggan (review) and with just cause. There’s also a live performance given in January 1959 with the New York Philharmonic Orchestra, which I described in a review as ‘one of great stature and character’. Unfortunately that performance is only available in two different boxed sets, one of which is extremely expensive, though it’s well worth hearing. It was an inspired choice to programme this symphony with the CPO because, as Robert Matthew-Walker reminds us in his excellent notes, Mahler was born only 90 miles from Prague. It’s marvellous to hear Barbirolli’s splendid interpretation of this symphony played by the CzPO with their distinctive Central European timbre. The long introduction to the first movement is expertly controlled both by conductor and players; there’s a terrific atmosphere and sense of tension here. When eventually the main body of the movement is reached and the pace quickens the music is full of life and freshness; there’s an open-eyed feel to the proceedings. The repeat is not taken – JB didn’t observe it in either of his other recorded performances. Whenever the music slows and becomes more spare of texture Barbirolli is patient in his pacing and careful in the balancing of the orchestra. The playing is super and I love the tang of the CzPO’s sound. The start of the second movement is just a bit too deliberate for my taste – Barbirolli was pretty consistent across his three recordings – though I readily acknowledge that the tempo indication includes the qualification doch nicht zu schnell. To be fair, I soon adjusted and that’s because though the pacing may be sturdy there’s plenty of life in the performance and the rhythms are well articulated. Also, the chosen basic tempo means that when Mahler requires the music to move faster Barbirolli can achieve a genuine one-in-a-bar without rushing the music off its feet. The trio is lovingly shaped with portamento in abundance: this is captivating. The solo double bass gets a bit carried away at the start of the third movement and comes in a bar early. Happily, only the timpanist is playing with him at that point so the error can be corrected with no disruption whatsoever. As various instruments join in the round I relished the piquant orchestral colours. In this movement above all there’s a rustic Bohemian feel and the brief town band interpolations are vivid and suitably garish. In the ‘Lindenbaum’ episode the strings are encouraged to play in a way that’s on just the tasteful side of schmaltz. It’s beguiling and the transition to that episode is beautifully sculpted by Barbirolli. The recorded sound is pretty good considering that this is from a tape of a broadcast from 55 years ago. However, in the finale I had the impression that the sound is somewhat compressed, probably as a result of the Czech radio engineers seeking to cope with the several passages in which the full orchestra lets rip. Even despite this compression one can easily hear that the performance is a cracking one. Launched with great energy, the opening stretch of the movement is very exciting. The great string melody that follows is gorgeously sung by the CzPO – and how daringly JB handles the transition to the melody! Yet the conductor doesn’t over-indulge in this richly romantic passage and he keeps the music moving forward in a way that I applaud. In the slower passages of this long movement the expressive rubato can’t have been easy for the players to follow, no matter how well it was rehearsed, yet the orchestra is with Barbirolli every step of the way. This nuanced and understanding account of the finale in which sentiment and white-hot passion are mixed reaches a most exciting, blazing conclusion. 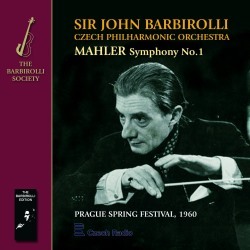 I don’t know if the 1960 Prague Spring Festival celebrated the Mahler centenary with any other performances but, my goodness, they got a tremendous anniversary celebration from Barbirolli. The Czech Radio recording has been well transferred by Paul Baily and despite its age the sound does justice to this tremendous performance. Even if you have one of the other Barbirolli recordings of the symphony you must hear this one. It represents Barbirolli at his finest. If I may repeat my verdict on the New York performance, this Prague reading is one of great stature and character but arguably the expertise and timbre of the Czech Philharmonic Orchestra makes it the most characterful of all his recordings of the work.